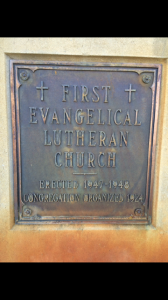 …….The First Lutheran Church on Ne 3rd Avenue is very historic for Fort Lauderdale. 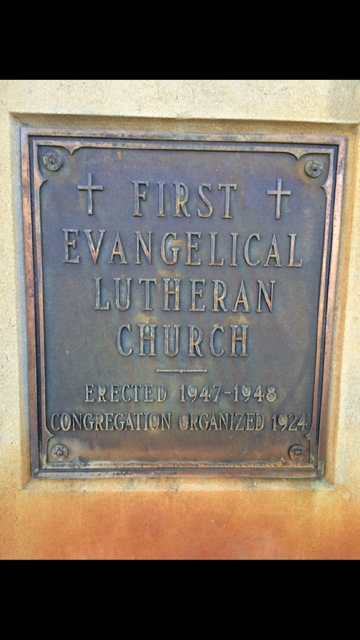 No one disputes this, though the City Commission deferred giving the 100 plus year old church historic designation at a hearing last month . 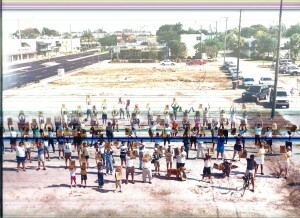 They are awaiting their May 2 meeting to see what the buyer ( developer) wants to do on the site until they act. ……. 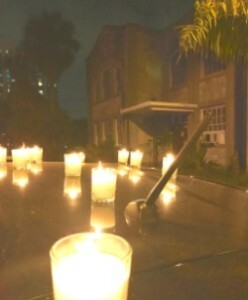 They held this vigil last night, and pointed out damage occurring there…. ……. this is an empty spot on the wall where …..
….. this brass corner stone plaque was last month ….. They say the air conditioners have been ripped out of the wall, the stain glass windows are all gone, and copper piping is disappearing…. ….. Come on May 2 ! 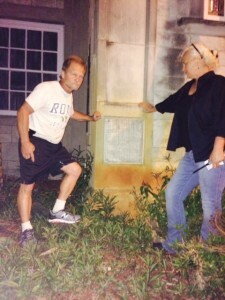 Humor me ….. more information on the past ! …. And many of you spotted others in the photo … Do you see Pat Mayers (deceased), Dean Trantalis, Mark Ketchum, Butch Neideritter, Mike Ferber, Floyd Johnson ( former City Manager), Gus Osterle ( deceased). Roger McKee ( deceased). Bob Pignataro, Bob Notti ( deceased), Steve Jacobson, Mark Warner, Hans, Alva White (deceased), Jim Kevern and Bob Oelke? ………… I’ll be back soon with my opinion of current City Manager Lee Feldman ……. ……………. 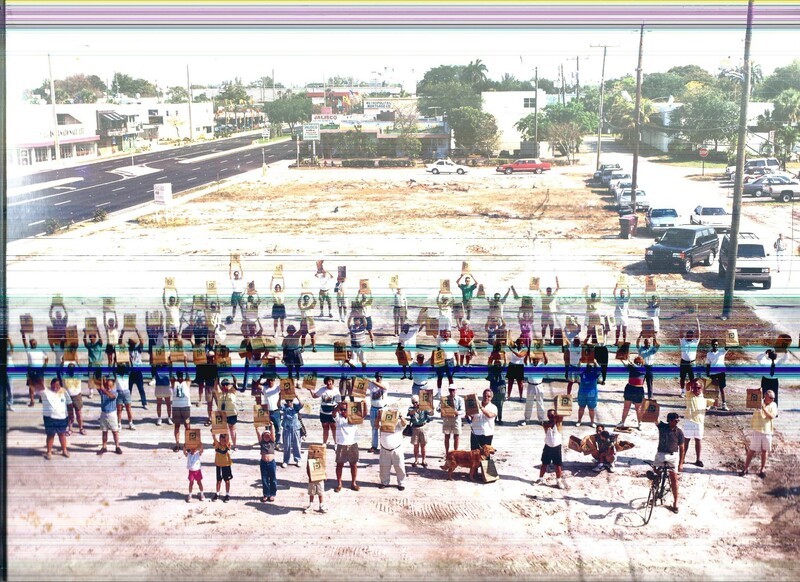 That’s about 100 Fort Lauderdalians, staging a protest in the 600 block of N.Federal Hwy. We were pissed that there was no grocery store anywhere near Victoria Park/downtown …..
…………… We are holding up Publix grocery bags. 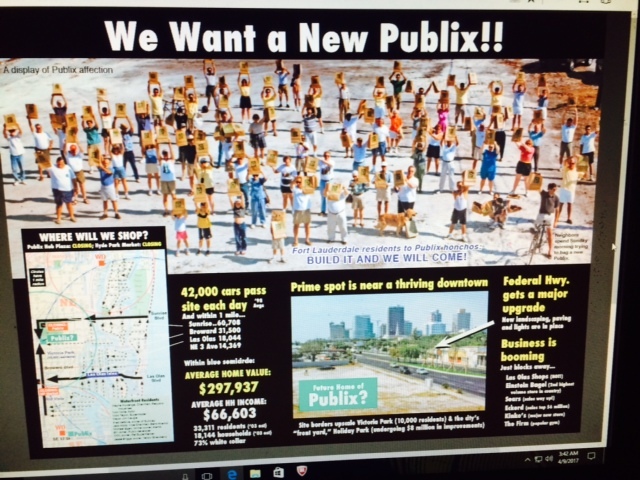 We took a big 3 by 5 poster of the picture to Publix headquarters in Lakeland …. 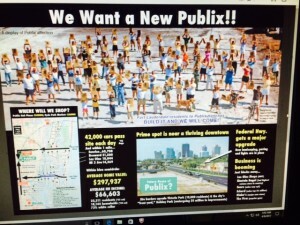 The effort kind of worked – today there is a Winn-Dixie plaza ! ……… See if you can find me, Cal Deal, son Timmy, Bob Oelke, Ted Fling and others in the photo !